A Halifax resident says the new street lights recently installed outside his home are so bright it's tough to distinguish between night and day. 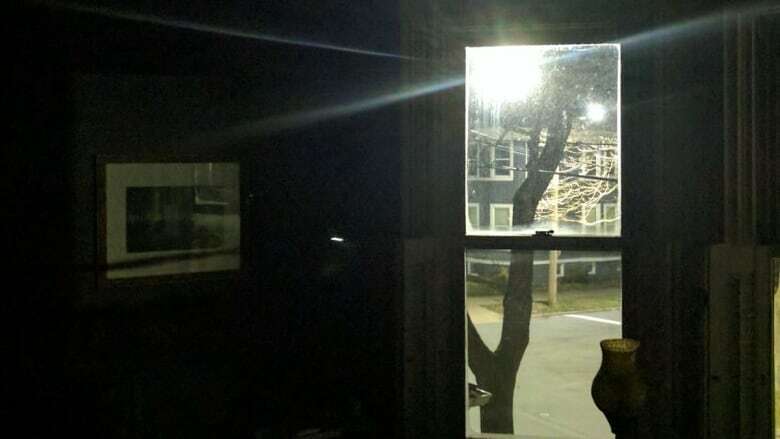 A Halifax resident says the new street lights recently installed outside his home are so bright it's tough to distinguish between night and day, but the city says a fix could come with a hefty price tag. "You can look out our window, look down and the trees are casting shadows because of lights everywhere. It's like living in a Walmart parking lot and it's unpleasant," said Patrick Moan, a resident on Edward Street in south-end Halifax. The municipality is a year and a half into a new energy saving project that will see 40,000 street lights replaced with high efficiency LEDs by 2022. "Our species has evolved slowly, over two million years or so and we're not meant to have daylight conditions 24 hours a day," explained Moan. The municipality's new lights are 4,000K (kelvins). "It's like having a large spotlight shone into the house and into the bedroom. We can actually read without any lights on at 11 o'clock at night without any lights on we can read books. It's very invasive," he said. Moan said his concerns are also echoed by the neighbours, some with children crying at night and others contemplating moving out of the area altogether. Bruce Zvaniga, the city's director of transportation and public works, said he's received mostly positive feedback since the project began. However, he acknowledges some are concerned about light that is significantly brighter than the old street lights. Zvaniga explained the 4,000K refers to the LED bulb colour temperature. He said the municipality is aware of what other cities are doing after studies show a person's circadian rhythm can be thrown off by too much light. "The challenge we have at this point in time is that the contract was awarded back in 2015 and had a certain specification," said Zvaniga. "And so to do it now really becomes a financial issue for HRM to decide whether it wants to replace relatively new LEDs that are out there with a lower colour temperature and the financial impacts of making that decision." The municipality has asked acting deputy chief medical officer of health Dr. Gaynor Watson-Creed to evaluate studies and material from other cities and provide the city with some advice on the extent of the issue. Zvaniga said there are many questions needing answers. "Where should we be looking at changes? Should it be only in residential areas? Should it be wide spread across the entire HRM? Or is it a bit of a trade off about the level of lighting that makes it safe for people who use the roadway versus the impact." Moan suggested a pilot project might have been a good idea. But Zvaniga said they were basing decisions on previous experience replacing LED lights on an individual bases and guidance by other cities. While the municipality is taking the public health concerns seriously, swapping out the bulbs comes with a big price tag that will also have to be considered. "If we were to do the entire city at 40,000 lamps it would be in the millions of dollars certainly. In excess of $5 million at least," Zvaniga said. The new lights do come with a feature that allows them to dim the intensity, but they'll need to wait until the installation is complete to access the technology and that won't be until the end of this year. The municipality has received 75 to 80 complaints since the project began that they're assessing one at a time and making adjustments. Zvaniga said he still needs more information to better understand the problem Moan and his neighbours are experiencing on Edward Street. But, he is hopeful there's a compromise that won't be too costly. Moan said in the meantime, round the clock daylight is making it tough for him to sleep at night. A compromise works for Moan who says he's hoping the lights can be dimmed or directed down reducing some of the light pollution.